Get set for a bumper seven card race as Contenders Day returns to Esher, promising an action-packed day of jump racing. It often provides pointers as to who might be a success at the Cheltenham Festival in March, so keep a keen eye on the winners and you could be in for a potential windfall. National 1 league team Esher Lionesses invite ladies who love rugby to attend a free taster session this month. No matter your fitness levels, pop along and play in a fun and welcoming atmosphere. Looking to get fit and make new friends? Touch rugby held in Farnham is a free midweek get-together for both men and women to enjoy the beautiful game whilst getting a good workout at the same time. Tired of the same old fitness regimes? Krav Maga combines elements of boxing, wrestling, judo and karate to give you a practical and tactical form of self-defence. If you’re keen on trying an alternative anaerobic and aerobic workout, head for this taster session. One of Sandown’s oldest and most prestigious race days, catch a card of seven races with a military twist. First featured back in 1878, the race has been a mainstay in the fixture calendar since 1921 and features horses that are serving or have served in the Royal Artillery. 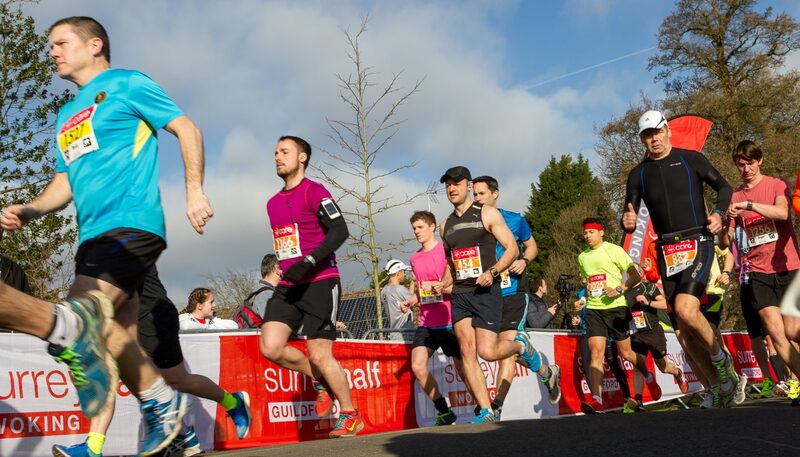 Take in the sights of Guildford by taking part in this 10k run. Open to all ages and abilities, set off from the Stag Hill campus of the university before finding your way through town and along the towpath beside the River Way – with all money raised going to local charities Oakleaf and Shooting Star Chase children’s hospice. As we firmly set foot into the second half of the season, it’s been quite the run for the Cards so far. Having mostly remained within the play-off, Woking will be looking to take all three points on offer against the relegation-threatened Weston-Super-Mare. With the Scorchers’ season in desperate need of some spark, can they bring the fire against the in-form Sheffield Sharks? Show your support at this afternoon tip-off at Surrey Sports Park. Kruise Reddick and John Dubar have quite literally been smashing it this season for the Flames – can they continue their rich scoring streak against the bottom-of-the-table Milton Keynes Lightning? Get a taste of the action and entertainment of Elite Leaugue ice hockey. Netball Superleague returns to Surrey Sports Park as Storm play host to last season’s high-flyers Lightning for an epic on-court battle. Having been truly stung by Wasps on the opening fixture of the season, Storm will be looking to claim all the points. However you voted, let off some steam on Brexit Day with this virtual run organised by AAT Events. Run wherever and whenever you like, as long as you do it on March 1, and get a medal for your efforts. Get wet, wild and downright dirty as the obstacle course of all obstacle courses – Nuts Challenge – returns to the wilds of the Surrey Hills. Choose from 7, 14, 21 or 28k races for a ridiculously fun-fuelled day of fitness. Regarded as one of the UK’s best half marathon and road races, sign up, set goals and beat PBs – all while raising money for a multitude of charities. Or if you’re planning to watch, be sure to check out the route so you know where to support all the racers. Take part in a historical half marathon commencing from Hampton Court Palace gates and concluding in its stunning gardens – if you’ve still got the legs for it, explore and get lost in the maze as well as checking out the world’s largest grapevine. Be an early bird and join this Saturday morning run club in Cobham. Organised by the super healthy folk at The Juice Smith, make new friends and get fit as you explore the Cobham countryside, followed by breakfast at the café. Like football? Like golf? Then this is the fusion for you. Play this pedestrianised adaptation of the beautiful game with a gang of mates, while gaining points along the way for your skill and accuracy.